Geared towards motivating the students of our country and encouraging them to achieve greatness and an entrepreneurial spirit in their lives, Project Udaan continues to redefine the meaning of an educational trip for kids. 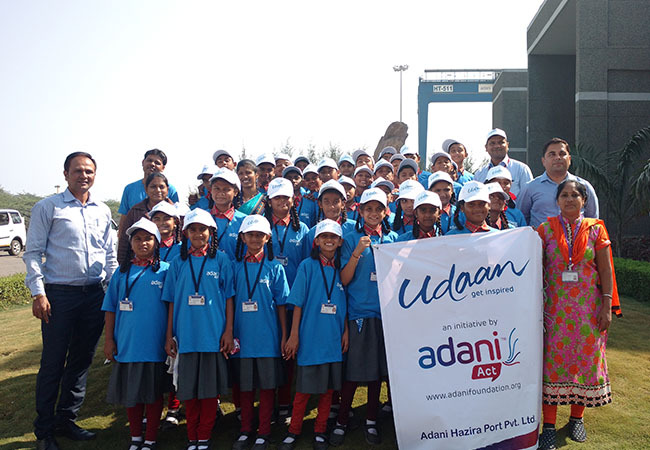 Based around the idea of providing an insightful tour of Adani facilities and operations to school students at Mundra and other Adani group locations, the project aims to inspire students to grow up to be leading visionaries and entrepreneurs of the nation. It’s been 8 years since this educational initiative by the Adani Foundation came to being in Mundra, Gujarat. And after recently crossing the 2 lakh mark at Mundra in terms of participants, Project Udaan keeps marching from strength to strength. In a day and age where education still continues to reside largely in between the pages of a school textbook and the four walls of a classroom, Project Udaan continues to create a difference in the educational sector by creating experience-based learning. At the heart of it all is the inspirational story of nation-building icon Gautam Adani, the Chairman of the Adani Group. While he was still a young boy with a mind full of endless possibilities and eyes riddled with curiosity, Gautam Adani visited the Kandla port in Gujarat. It is here that his dream of becoming a successful entrepreneur was born after the young boy was overwhelmed by the expanse of the port, the huge ships and tankers by the water, and the imposing vessels and containers lining the harbour. Today, he is pegged as the visionary who is on his way to transforming the entire coastline of India. And now he wants to gift this inspirational experience to every child and student in the country; he is entirely convinced that if a trip to a port could inspire and influence him to such a great extent, it is bound to have the same pronounced effect on young, smart minds of the nation. Indeed, the massive numbers achieved by the project point towards the scale and popularity of the entire initiative. Since 2010, an utterly impressive more than 2.25 lakh students (all India) and participants have had the opportunity to take part in Project Udaan. It is an inspirational tour wherein students are given a chance to visit the Adani Group facilities such as Port, Power & Edible Oil refinery facilities at Mundra & Hazira in Gujarat, Kawai in Rajasthan, Tiroda in Maharashtra, Dhamra in Odisha and Udupi in Karnataka. The major objective behind organising such visits is to encourage young minds to develop an interest in all sorts of enterprises and to encourage them to dream big in life. The students are also accommodated in modern hostels, provided transport throughout the tour, provided with wholesome meals, and imparted fun interactive sessions, both oral and audio-visual, on the various operations. In the end, Project Udaan keeps the conveyor belt of India’s young dreamers moving from hope to inspiration, and eventually, from perspiration to success. The culmination of it all, for the Adani Foundation, would be the discovery of the next brilliant visionary. For the country, however, it would be the beginning of a new successful chapter. Here’s to another set of 200000+ young minds inspired at Mundra alone.